Black Hat SEO techniques are the worst possible approaches anyone can use in an attempt to improve their search engine page ranking. Yet, every day business owners fall victim to unscrupulous SEO "experts" who practice them. The term "Black Hat" not only applies to the techniques, but to the very SEO experts who exploit them. Search engine companies spend hundreds of millions, if not billions, of dollars each year tweaking their algorithms to thwart the attempts of Black Hats. Black Hats can produce very quick temporary results, but the risk to the business owner is enormous. 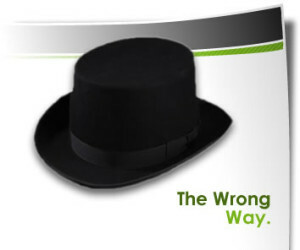 Not only do Black Hats charge a lot of money, but a business risks having its website delisted from search engines for unethical and deceptive optimization practices. Why would any hard working and respected business owner risk damaging their reputation like that? Before I delve more deeply into this topic, let me insert a little disclaimer. I am not writing about Black Hat techniques to teach you how to use them. This article is meant entirely to be a consumer education piece. An informed consumer is one who is protected from unfair and deceptive practices in the marketplace and I want to help you become an informed consumer. Link Farms: tightly-knit communities of pages referencing each other, also known facetiously as mutual admiration societies. Today there's an ongoing war between the search engines and Black Hats. As the search engines determine to tweak their algorithms, the Black Hats are equally determined to game the system. To emphasize just how serious search engines are to defeat the black hats, here's an article first reported by the New York Times detailing how JC Penney got caught black hatting: The Dirty Little Secrets of Search. Do everything you can to avoid the Black Hats. Ask questions before engaging a SEO consultant. I am so happy by your blog post its very nice and it gives a better knowledge about the black hat seo and white hat seo…..Thanks.